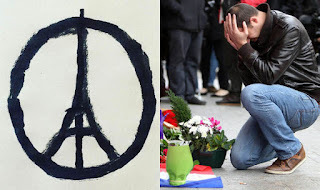 Video Bohemian: My comments on the Paris Attacks - Je suis Pissed! My comments on the Paris Attacks - Je suis Pissed! You know, we've seen it before: terrorist attacks like the nuts who put gas on that train in Japan or the IRA nuts who blasted a nail-bomb in the Queens Garden -- to name two. I was saddened as I've tried to understand those. This attach on Paris, however, has left me with an anger as if I just watched a beautiful woman being attached by a thug. I guess it is the "Paris is a Lady" thing, you know, the femininity of her spirit which has been written about by Hume, Proust, and Wilde. Yes, the feminine nature in all of us. Therefore, I must now say to those who have done this: I'm done trying to understand you, now it is time for revenge. We will revenge her. Watch yourself.